For more than 20 years, TransGard fences have prevented power outages from squirrels, raccoons, snakes, and other climbing animals. 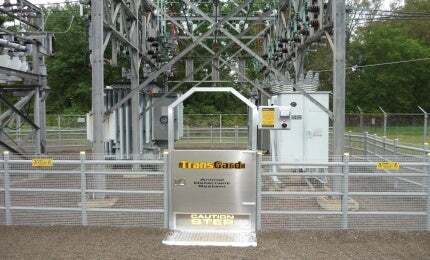 TransGard’s patented fencing is the only system trusted to protect more than 2,500 North American substations. Every year, animals cause hundreds of substation outages that leave thousands without power and cost millions in repairs. With the prevention of a single outage, a substation operator recoups the cost of a TransGard system. America’s largest utilities, regional providers and rural electric cooperatives have relied on TransGard for more than two decades. TransGard fences deliver a mild electric shock that deters climbing animals but will not harm them, or humans – a humane approach that, according to Institute of Electrical and Electronics Engineers (IEEE), offers the most effective barrier against animal incursion. Transgard fences feature a unique modular design that offers fast installation, easy access and simple reconfiguration or expansion. The system features three primary components. Entryways offer access to the substation’s equipment. The Control Centre houses the electronic components that operate the system and modular panels form the fence perimeter. The system’s components are connected to the power source and each other via 12.5 gauge galvanized steel jumper wires. TransGard Systems was founded in upstate New York in 1990, in response to multiple animal-caused outages every year at substations operated by Rochester Gas & Electric. The company’s fences were designed, developed and enhanced through collaboration with utilities, and later patented. After years of steady growth, TransGard Systems moved to New Freedom, PA, in 2009 to take advantage of centralised distribution and the area’s manufacturing workforce. For more details on TransGard Systems, visit www.TransgardFence.com. Read our case studies, learn more about what our customers say, or use our ‘Request for Quote’ form and we’ll get back to you in 24 hours or less. Each year, TransGard names the five worst substation outages caused by climbing animals. TransGard fences deliver a mild electric shock that deters climbing animals but does not harm them or humans. This is a humane approach that, according to the IEEE, provides the most effective barrier against animal incursion. The full panel is the largest modular panel. TransGard's Full Panel With Snake Guard comes with an optional snake guard to prevent incursion from snakes as small as ¼” in diameter. The Step-Plate Entryway provides entry to the system enclosure. This product offers a secondary entrance and is used for enclosures that require multiple access points or additional exits. TransGard's System Control Centre houses the system’s electronic components. Substations across the US have seen an increase in the number of raccoon-related outages. TransGard Systems has unveiled a new control centre for its substation fencing, the industry’s leading defence against outages caused by climbing animals. Every year, climbing animals that find their way into US substations cause power outages that affect hundreds of thousands of customers and cost millions in repairs, man-hours, and lost business.